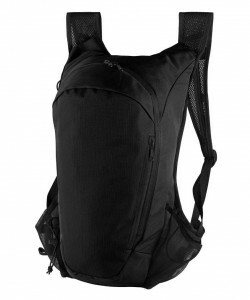 Ergonomic backpack in polyester 600D PU backing with water container holder. Ideal for ultra trail/running/trekking/ATB sports. Zipped front compartment, large belt with zipped pockets and one mesh pocket. Side loop to hold trekking poles. SBS zips.